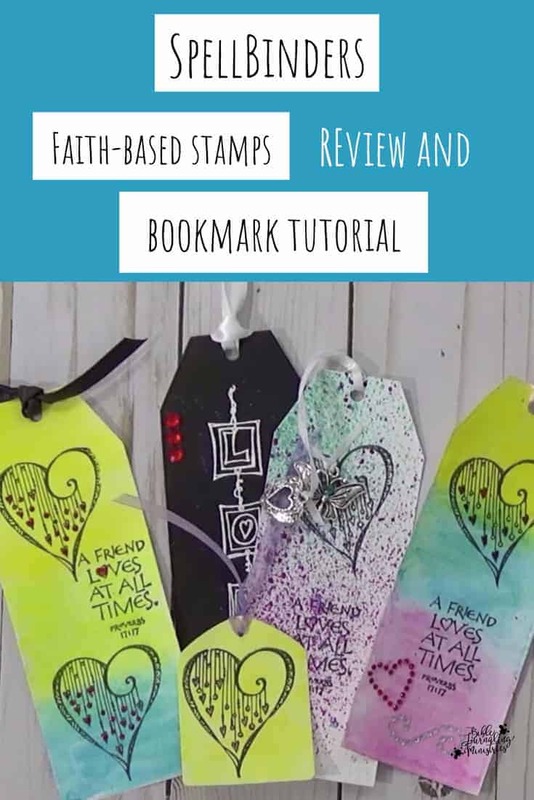 In this tutorial, I’m going to show you how to make one of these really cute bookmarks using Spellbinders latest release in the faith-based series. This series was designed by Joanne Fink who is the author of the Complete Guide to Bible Journaling. I was really excited to these stamps in the mail the other day (Spellbinders, so thanks so much for sending them along). Each of these sets retails anywhere from $9.99 to $24.99 for the stamps with dies. The stamps are red rubber stamps, so they’ll make a great impression every time you use them. Just mount them on a block. They stick really well! I’m sure you can have a lot of fun Bible Journaling with these stamps, but they’ll also make great bookmarks, Christian faith-based cards, and more! On the back of every stamp set is an example design. Use it to inspire you! In this video, I share the latest Spellbinders Bible journaling stamp line designed by Joanne Fink. These stamps were sent to me by Spellbinders for this review. If you’d like to support our ministry with your purchase, please use the links below. You may also purchase these stamps at Spellbinders.com. I have to say Spellbinders makes awesome dies. They always cut well, and they’re really well-made. As I was testing these dies out, I wanted to know how many I could cut in one pass. I’m a busy gal, and I don’t want to lose an arm cutting a hundred of these. I found that the maximum amount of bookmarks you can get with one pass of the machine is three. This assumes you’re using 65-pound cardstock. Obviously, the idea is that you’re only creating one book mark per run through your die cut machine. So don’t call me or email me if you break it!!!! Triple cut at your own risk! The first thing I do is put my Ranger craft mat down to protect my work surface. I’m using three different colors of gelato because I love gelatos and they’re so fun to play with! I use lemon, ice pear, and cotton candy colors in the video tutorial. Start by laying down some color. Then add a spray of water and begin blending the gelatos on to the bookmark. I use my finger, but you can use a paper towel if you want. I just play, it’s fun for me. I like making a mess and having fun with different mediums. Once you like how it looks, let it dry or use a heat tool to dry it before moving to the next step. The new Tim Holtz Tonic Stamping Platform is amazing! It’s just now hitting stores and is available on Amazon. The purpose of the stamping platform is to ensure you get a perfect impression every time. If you don’t get the right impression the first time, you can try again! There is another brand called the Misti, which was the original creator of the stamping platform idea. What a brilliant person to create it and bring it to market! Tim’s stamping platform is quite a bit different than the original Misti. For one, it’s two sided. There’s one side for red stamps and the other side for clear stamps. Just pull off the clear plastic top and use the side that you need. In the video tutorial, I use the heart and the “A friend loves at all times” stamp. I also use Memento dye ink. I usually use Memento ink when I’m not stamping in my Bible and when I’m using an alcohol marker. This is because the ink doesn’t smear when I use an alcohol marker. To stamp the image, place the clean stamps on the bookmark to create the design that you want. Using the clear platform top, press it down on the stamps to pick them up. Ink the stamps, then place the platform down on the bookmark. Life up to see the image. If you’re not happy, re-ink the stamp and try again. Stickles are like glitter glue, and they dry flat. Just dab a little bit of it on the small details. A little goes a long way! Let it dry, add a ribbon, and you’re finished! One of the greatest things I love about Joanne’s stamp set is the intricate design set she creates. If I had to do each of these dangles and hearts by hand, which I have, it would just take a lot longer than stamping an image. I also don’t have really good handwriting. I’m always learning and working on my handwriting and art. But, it’s great when I can just take what’s provided on the package and run with it. No stress what so ever. I am so excited that I had the opportunity to share these beautiful stamps with you. 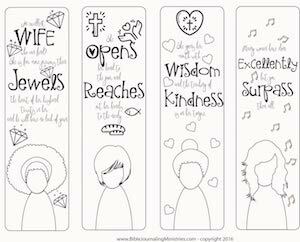 Do you like the new Spellbinders Bible journaling stamps? I’d love to know what your thoughts are in the comments below!